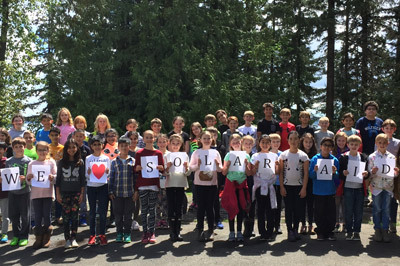 Students from West Bay Elementary, Vancouver with their “We Love SolarAid” message! Students of West Bay Elementary, Vancouver, Canada generously organised a fundraiser for SolarAid. The grade four class fundraised by organising a raffle, with prizes purchased thanks to donations made by the school’s parents association. Ticket sales at the school lasted 2 days and the students expanded the reach of the fundraiser by selling more tickets to friends and families. They also made personal contributions to these efforts by donating some of their savings. The final donation was an impressive £600. We are incredibly grateful to the students of Grade 4 for their support, thanks to their donations a significant improvement will be seen in the lives of solar light users in Africa. To get a picture of the impact of such a donation, this £600 fundraiser will help children study for an extra 150,000 hours and offset 159 tonnes of CO2 emissions. Thank You, Grade Four Students of West Bay Elementary.